Announcement : NEW SKATERS' ID !!! Barbara Bossi : Speed slalom is a "real sport"
Chinupun Nichakan : I will work hard to improve my skills for the upcoming season! 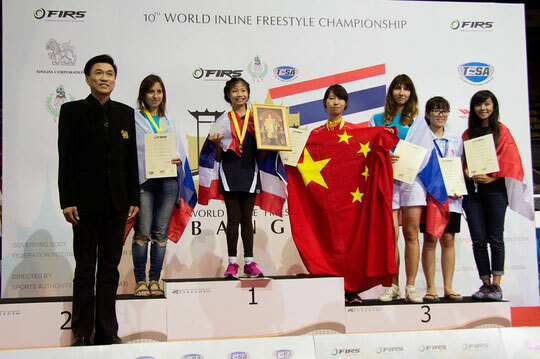 Two WSSA World Records for Lo Pei-Yu and Pan Yu Shuo! Chinupun Nichakan from Thailand showed her best result ever, winning the Women's Slides final of the last World Championship. Here she shares her emotions about the biggest victory in her skating career. "For sure I didn't expect to win so I am very happy with my first place! ", Chinupun Nichakan said. "For me, it was the most difficult event I've ever attended because all the best athletes were there to fight for the World Champion title. Anyway, I really enjoyed this World Championship. It was the best opportunity to meet new and old friends from so many countries. It was so good to skate all together. I will work hard to improve my skills for the upcoming season!"